It’s tough to think of what to say about a comedy. The bottom line is; is it funny or not? And Tropic Thunder is extremely funny. My whole thing is that that I saw The Dark Knight. I feel like I’m dumb because I feel like I don’t get how many things that are so smart. It’s like a Ferrari engine of storytelling and script writing and I’m like, ‘That’s not my idea of what I want to see in a movie.’ I loved The Prestige but didn’t understand The Dark Knight. Didn’t get it, still can’t tell you what happened in the movie, what happened to the character and in the end they need him to be a bad guy. I’m like, ‘I get it. This is so high brow and so f–king smart, I clearly need a college education to understand this movie.’ You know what? F-ck DC comics. That’s all I have to say and that’s where I’m really coming from. You liked The Prestige but didn’t understand The Dark Knight? Did you get The Prestige? Are you sure? TDK, while it may be complex, isn’t nearly as complicated to sort through as The Prestige. And while we’re on the subject of complicated movies, how about Iron Man? I don’t remember any major plot points – just explosions and awesome flying scenes. Oh, and lots of tech gadgets. Maybe that’s why Robert Downey, Jr. didn’t get The Dark Knight – maybe he thinks superheroes are supposed to be simple. Go check out Moviehole.net for the whole interview. 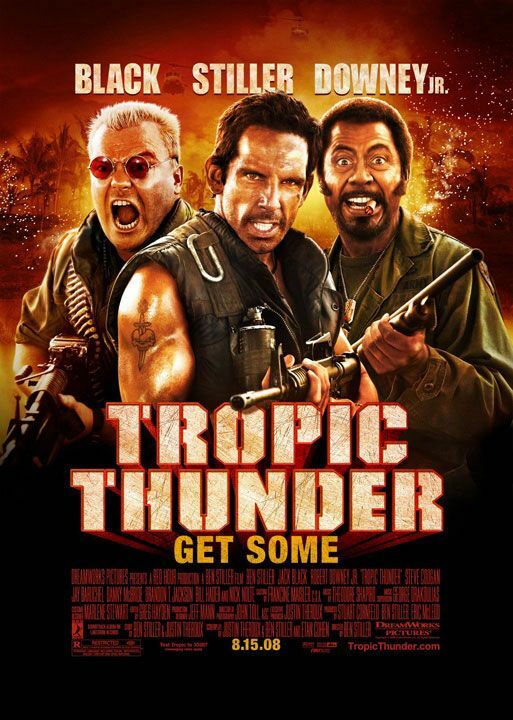 Tropic Thunder is a movie within a movie starring Ben Stiller, Jack Black, and Robert Downey, Jr. As you can see in the poster below, our Iron Man is playing an unlikely character…a black man. Tropic Thunder will be in theaters August 15th.